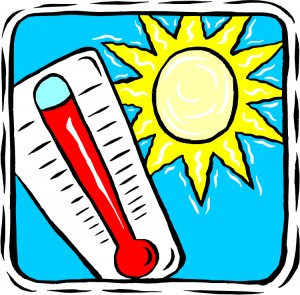 The hot days of summer leave us wishing for cooler temperatures especially when it comes to cooking, so why heat up the kitchen when you can prepare food that requires just a little bit of imagination and a few simple steps that completely eliminates the oven or stove. These easy recipes will get you out of the kitchen, and back to enjoying your summer days while relaxing or playing outdoors. Our host this week is Jen from Juanita's Cocina . She came up with this brilliant theme to keep us all cool! In a large mixing bowl, stir together the yogurt, half and half, cucumbers, red onion, scallions, salt and pepper. Transfer the mixture in batches to the bowl of a food processor. Process until the cucumbers are coarsely pureed then pour into another bowl. Fold in dill, cover with plastic wrap, and refrigerate for at least 2 hours, until very cold. Just before serving, stir in the lemon juice. This completely transforms this soup! Serve chilled, garnished with the shrimp, lemon, and fresh dill. *Cut the shrimp in half horizontally to make them easier to eat. If you like cucumbers with sour cream, you are going to love this soup! Our fabulous #SundaySupper team has come up with these amazing recipes to Beat The Heat! This seems so perfect for this hot weather! And delish! Thank you for participating in this week's #SundaySupper! Oh my goodness, I want to go right through the screen and take a bite of this delish soup and that shrimp! Wow! Thank you so much for sharing this recipe during #Sundaysupper. I am so glad you are a big part of our group! I bought some long burpless cucumbers at the market and I think they would be fantastic for this soup. Thanks for sharing this recipe! I love these kinds of soups - the shrimp looks so regal in your pic! Great shot! Thank you so much for sharing! What a great idea to beat the heat of a summer day! Cucumbers chill us off so well! 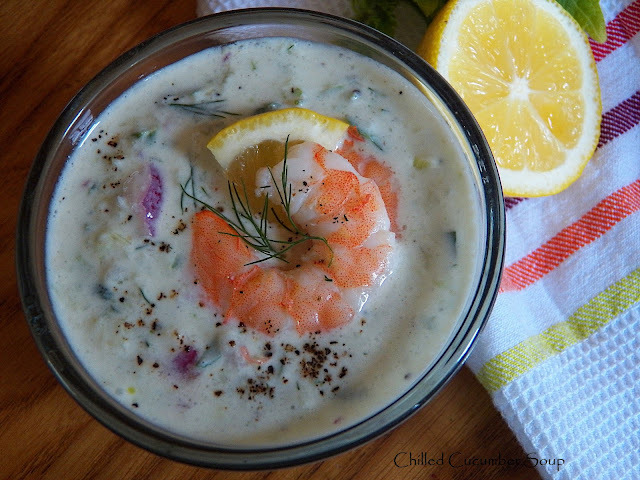 Love the idea of adding shrimp to cold cucumber soup - brilliant! Mmmm.. cucumber soup. Heard of it, but never tried it. Love the addition of shrimp! This sounds amazing! Sounds healthy and refreshing. I will definitely try this. Thank you for sharing. I love cold soups! Got to make this! I have yet to make a cold soup!! I bet my family would love this! Your picture is beautiful! I just want to slurp up that gorgeous shrimp! Hold the shrimp for me, but let me tell you this sounds excellent, not to mention extra refreshing! This looks amazing! I adore shrimp and simply must make this. This is a great recipe (and photos) for #SundaySupper! I love soup and this chilly cucumber soup is perfect for summer. Thanks for sharing your Sunday Supper! I've been obsessed with cold soups lately, and I'll be making this one soon! Love chilled cucumber soup and your version is terrific! Thanks for the chilly dilly cucumber soup with shrimp recipe. and we'd like to invite you to submit your food photos on a Food Photography site so our readers can enjoy your creations. I've never heard of cucumber soup but it sounds fabulous!